A snag is a standing tree that is dead or dying, and often is missing the top and most of its smaller branches. To some, it might seem that a tree that is dying has served it's useful purpose, but it still has a lot to offer, actually! Snags play a part in important ecosystem functions such as nutrient cycling, being a food source for organisms and providing habitat for wildlife. They are dubbed “nature’s apartment complexes” because the decomposing wood is soft enough for cavity excavating species to make entrance holes and cavities. Most species that use snag cavities are birds and bats, though squirrels may sometimes use cavities as well. Primary excavators, such as woodpeckers, excavate the cavities for feeding. They peck away at the snag to reveal insects to eat. Secondary cavity users use existing cavities for several purposes, including feeding, breeding, nesting, shelter and food storage. Some species of wood-boring beetles are quick to colonize a tree after it dies. They create tunnels in the deadwood which attracts other beetle species to live in. 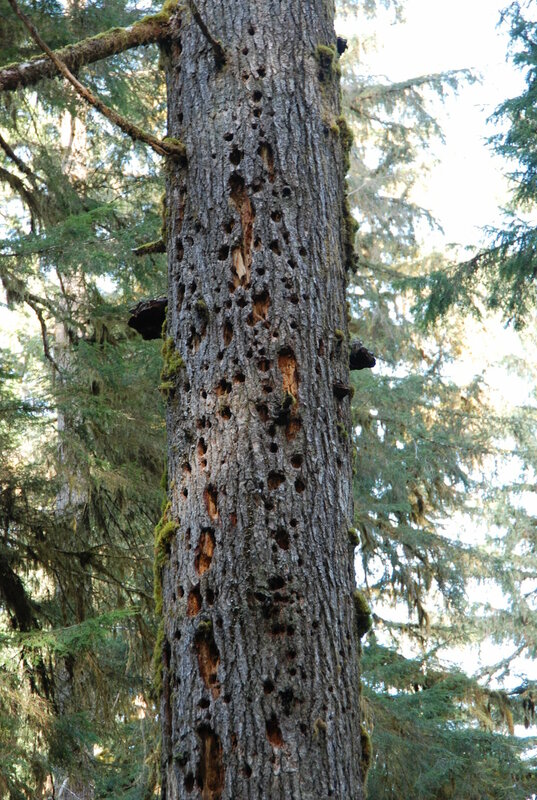 The accumulation of beetles in a snag results in an abundance in their predators – namely, the woodpecker. The pileated woodpecker is the largest woodpecker species in North America. 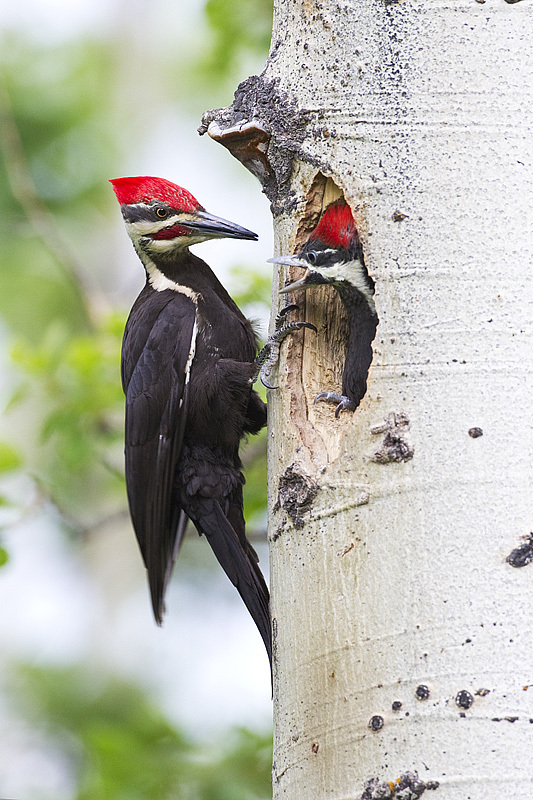 Like wood-boring beetles, pileated woodpeckers create cavities which are inhabited by secondary cavity nesters. In some areas, cavities created by pileated woodpeckers are used by as many as 80 species! How long a snag remains standing depends on many factors, including its size, tree species, and climate. Some large conifers can remain intact for up to 100 years, while aspen and birch decay faster and break down within 2 – 10 years. Even after a snag has fallen to the ground (in which it becomes a “log”), it continues to serve an important role in providing food and shelter for several organisms as it decays. As deadwood decomposes, it releases nutrients into the underlying soil. A study examining the effects of decomposing logs on nutrient cycling by Spears, Holub, Harmon, and Lajtha (2003) found that soil underlying coarse deadwood contained three times more dissolved organic carbon than soil on sites with no deadwood. Snags and logs also serve as important substrates for saproxylic (deadwood-dependent) fungi and mosses. Due to habitat loss, there are fewer areas where cavity users can find what they need to survive. EALT’s conservation lands are prime real estate for wildlife, and include many snags. Protecting these natural areas ensures that cavity dependent wildlife can find the shelter and food that they need. To enhance the habitat for wildlife, we also install nest boxes on our conservation lands, to provide cavity nesting species with more opportunities to raise their young. If you have a forested area on your land, you can help maintain healthy forests and habitat for wildlife by allowing snags to form and fall to the ground. Whether standing or after they have fallen, dead trees can provide important habitat for wildlife. Furthermore, you can build and install a nest box for birds. If you live in the city, install a nest box for chickadees; if you live in the city outskirts or in a rural area, find out what other cavity nesting species are in your area for which you can provide a nest box. In the Edmonton region, these include: northern saw-whet owls, bufflehead, common goldeneye, tree swallows, bluebirds, northern flickers, chickadees, wrens and others. Support the EALT to provide more homes for wildlife through conserving natural areas with snags and enhancing habitat with nest boxes. See our Nature Factsheets in our library for more information about Snags, and other benefits of nature.